Anyways, today I saw my countdown. I realized I'm in a pre-2 week wait! So many fellow bloggers have been so encouraging!! 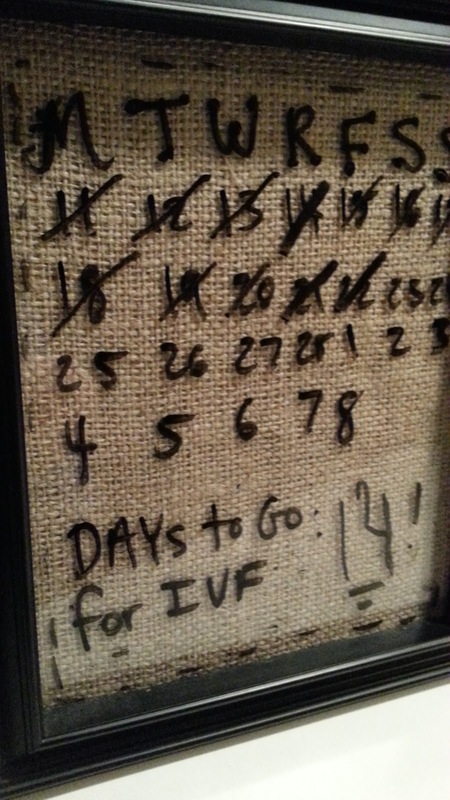 One online friend named Jen (you can see her blog here)had to go through a miscarriage and 2 IVFs herself and is currently expecting her little miracle soon. She encouraged me to remain positive and to almost think of myself as currently one-week pregnant. In a very positive/optimistic world, I guess that makes sense! I will find out in less than 4 weeks if I'm four weeks pregnant. Now that is seeing the glass 90% full! I know in my heart if I honestly have a 50% chance, I might as well choose to dwell on the positive chance than the negative since they are equal. It's jus so scary to allow hope in when it has hit me so hard before. Thank you to all who follow the blog, pray, comment, etc. God has brought you all to me and I pray for you all by name. :) Let the Backward Two Week Wait Begin!! I am praying so hard for you! Stay strong and faithful.